We’re delighted to share the winners of this year’s Fairtrade Fortnight Award for Schools. We had a lot of entries this year which made it incredibly hard for the judges to pick the winners. We were looking for IMPACT, IMAGINATION, EDUCATIONAL CONTENT and RELEVANCE TO THEME. Scartho Junior Academy in Grimsby!! Students at Scartho Junior Academy made and sold a recipe book called ‘Can We Bake The World A Better Place’ full of Fairtrade recipe ideas! They held an Afternoon Tea for students’ families and used the opportunity to tell everybody what they had learnt about Fairtrade. They got an article in their local newspaper and shared their event on Twitter so had lots of coverage. Well done Scartho Junior Academy – we loved reading your entry! 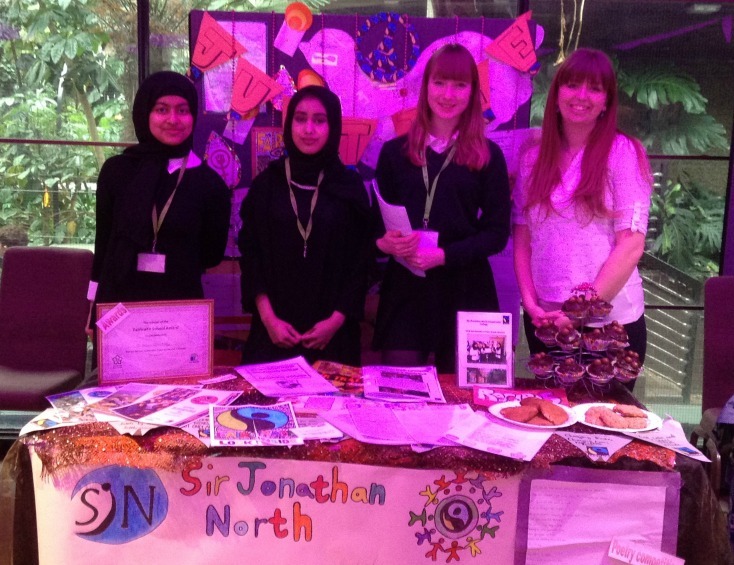 Sir Jonathan North Community College in Leicester!! “It is no longer enough to be aware of today’s global issues. It is not acceptable anymore to acknowledge, discuss and move on. By making a choice, as little as it seems, it’s a small step, in the right direction, to a better world. You are the decision maker and it is you who has the choice. St Peter’s Academy in Stoke on Trent hosted a Fairtrade Break with the Fair Trade in Football Campaign, involving Stoke City Community Trust and Port Vale FC. They had a smoothie bike, a Fairtrade football shy (like a coconut shy) and even attempted to smash a Guinness World Record. Medway Community College in Leicester did a fantastic amount of work in preparation for their Fairtrade Breakfast event. They practised their persuasive, formal writing skills, made questionnaires and designed leaflets and posters to make their event all about Fairtrade. They even incorporated their Fairtrade work into maths, ICT and science. St Catherine’s Catholic School in Kent sent in a beautiful book of students’ work, showcasing graphs, collages and pieces of writing. They even raised £135 during their Fairtrade Break and raffle! A big thank you to all of the schools that entered – we loved reading all about your Fairtrade Fortnights and were inspired by the imagination, the passion and the creativity of your events.